This is totally grain free and gluten free. And since I purchased all of the ingredients packageless*, it produces zero landfill waste too. Okay so there’s a lot of things it isn’t but there’s one thing it definitely is (in my totally humble opinion): totally delicious. 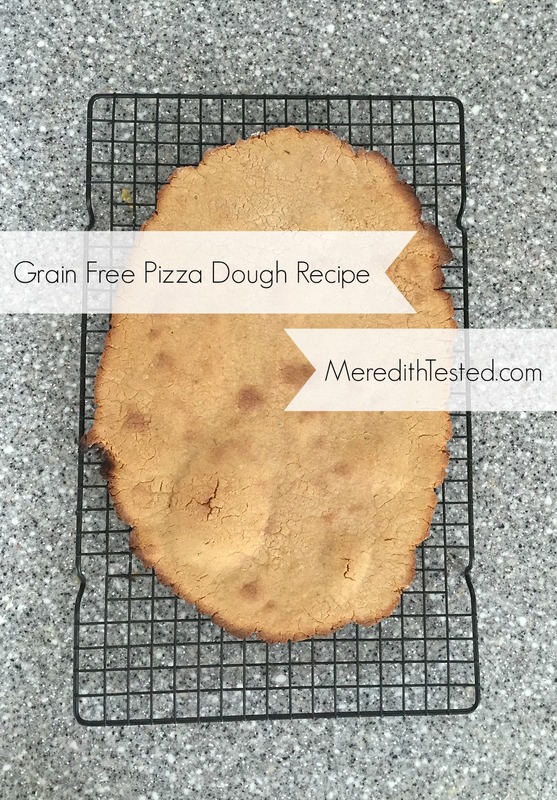 If you’re used to gluten-full dough this might be a little denser than what you’re used to but I think it’s really tasty and versatile – put whatever you want on top and it will be good! My family and friends love this recipe, too. I don’t take their word for it, I just witness as it disappears really quickly after I make it! Combine the sweet potato flour, arrowroot powder, salt and 1/3 cup coconut flour in a medium bowl. I often sift in the coconut flour to make sure there aren’t any lumps. Pour in oil and warm water and stir. Add the whisked egg and continue mixing until well combined. Add two to three more tablespoons of coconut flour – one tablespoon at a time – until the mixture is a soft but somewhat sticky dough. Place the dough onto a surface sprinkled with arrowroot (or sweet potato, if you want) flour and knead it very gently until it is in a manageable ball that does not stick to your hands. Put the pizza dough ball onto a sheet of parchment paper or reusable silicone baking mat. Put another piece of parchment or baking mat on top. Use a rolling pin to carefully roll out the dough until it is an even thickness. Carefully peel back the top layer of parchment and place the dough (and the bottom paper/mat) onto a baking sheet. Bake for 12-15 minutes until the edges are just beginning to brown. At this stage you can cool and freeze for later or add toppings and pop back in the oven for a few more minutes to warm the toppings, melt cheese and crisp the crust. I make this recipe about once a month, sometimes doubling the recipe and make individual crusts to freeze. When the mood for pizza (or lack of other food in the house) strikes, pull out the frozen dough, top with whatever you want and put the whole thing in a 400 – 450 degree F oven to warm up and defrost. It will warm up in a microwave, but you won’t get as nice of a texture. Your oven time and preferences for dough texture/crispiness may vary so the first time you make this, check more often for done-ness. A note about buying gluten free flours in bulk: Where I typically shop the gluten free flours are separated from all other flours so the risk for cross-contamination is low. If your store has the wheat flours and gluten free flours close to each other, put in a request to have them moved, or you may want to purchase pre-packaged from Bob’s Red Mill, etc. It is not ideal from a trash-generating perspective, but it is better than getting sick if you are Celiac or have a severe intolerance to wheat or gluten. Spices and other flours are also readily available in the bulk section of many stores. Bring your own containers or cloth bags and you’re good to go! You’ll come home with delicious stuff … and none of the packaging that just ends up in your trash. Hope you enjoy this recipe – please let me know in the comments/tweet me/tag me on Instagram if you try it!